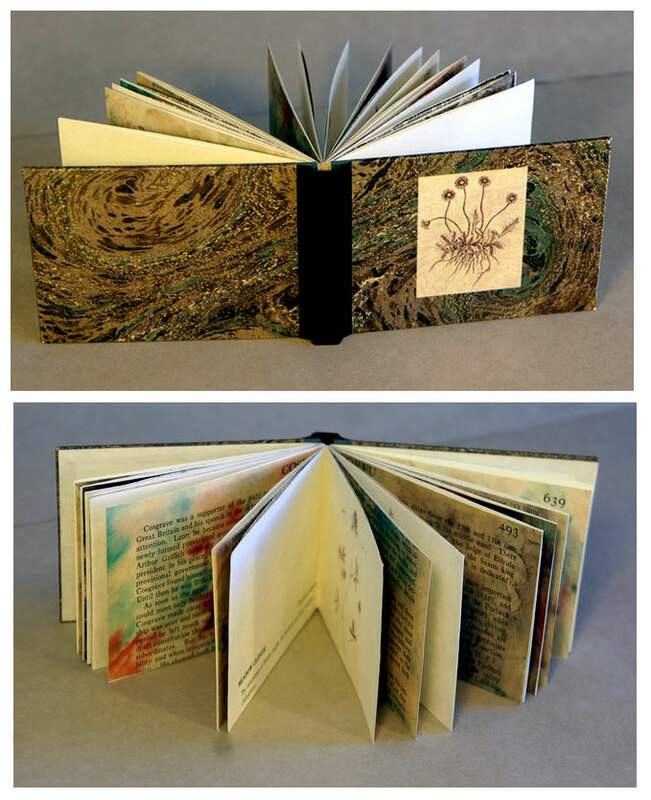 www.gibbsbookbinding.com: "Artist's books fuse text and art in an interactive sculpture — children's books for grown-ups, in a way. They tell stories using text, pictures, and structure." Los Angeles: Stephanie Gibbs, 2018. Edition of 16. 6.5 x 8"; 58 pages. Five color screenprints on hand dyed Crane's Lettra. Digital printing on paper vellum. Bound in quarter leather with abaca covers. 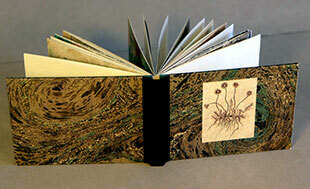 Design, screenprinting, dying, and binding by Stephanie Gibbs. Numbered. Initialed by the artist. References: Chiromantie, Johannes Hartlieb (ca. 1485-95);. Finger Prints, Francis Galton (1892). The Universal Declaration of Human Rights, UN (1948). Forensic Science in Criminal Courts, President's Council (2016). Gibbs accompanies excerpts from the "The Universal Declaration of Human Rights" with texts regarding analysis for DNA, bitemark, fingerprint, footwear, hair, and firearms residue. 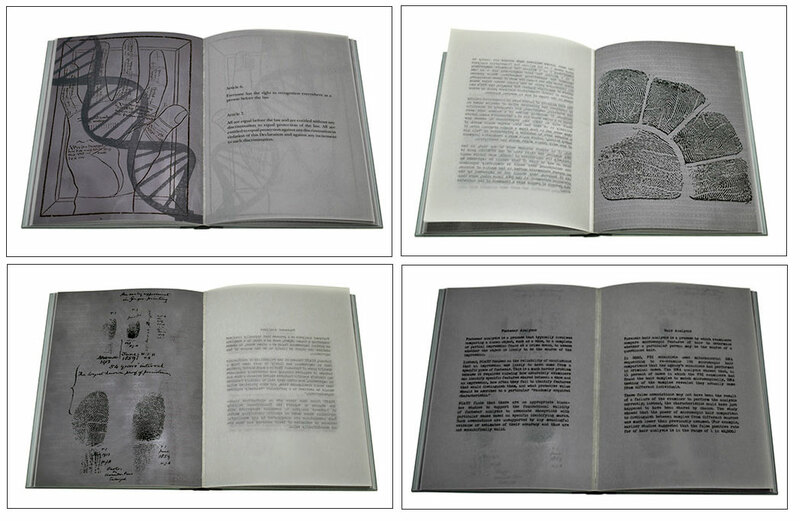 Images of palm prints and fingerprints are interspersed throughout the text. Stephanie Gibbs: "Fate is written in many forms: in the line of a palm, in the swirls of a fingertip, in the helix of a chromosome. "While forensic science is accepted by many as inarguable proof of guilt, numerous studies have called into question both the theory and the practice of forensics, as it is often used to reinforce previous assumptions rather than to question them. Many methods commonly accepted as indicators are instead reflections of what we wish to see. "Galton, the inventor of fingerprinting, has been called 'racist even by Victorian standards.' In many ways, fingerprinting is the new palmistry: fervently believed, in spite of any evidence to the contrary." Los Angeles: Stephanie Gibbs, 2018. 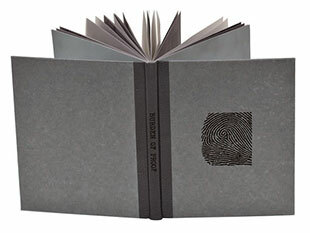 Edition of 16 (8 deluxe, 8 standard). Standard: Enumerations book only. 3.5 x 7.5"; 24 punch-card leaves and 14 graph-paper leaves. Digitally printed onto unused computer punch cards. Trigonometry screenprints printed on vintage graph paper. 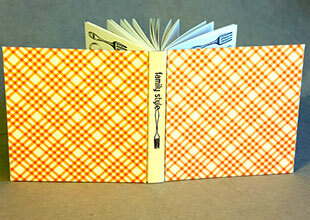 Design, screenprinting, pastepapers, and binding by Stephanie Gibbs. Bound in pastepaper over boards with cloth spine. Title in silver on spine. Numbered. Initialed by the artist. 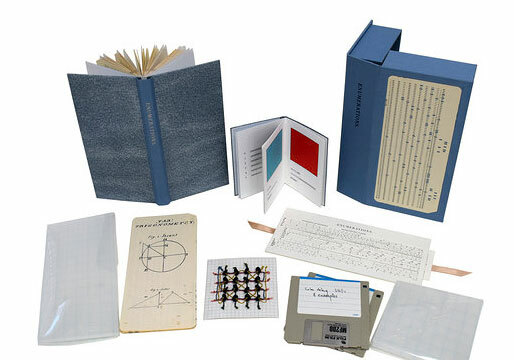 Deluxe: 4 x 8 x 2" clamshell box containing A Primer, Slide Rule, Enumerations, Trigonometry screenprints, diskettes, magnetic core memory diagram. Box cloth-covered with punch card on top lid and title on spine. Ribbon lifts. Stephanie Gibbs: "The text of Enumerations is the 'Note' in which Ada Lovelace, mathematically trained daughter of Lord Byron, describes Charles Babbage's Analytical Engine. This first computer was based on Jacquard looms and the 'Note' references a specific encyclopedia article on loom technology. "The trigonometry imagery is from Cyclopaedia: or, An Universal Dictionary of Arts and Sciences, Ephraim Chambers, London, 1728. The trigonometry screenprints in the book were printed on vintage graph paper from the United States Department of Agriculture." 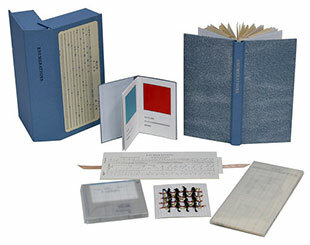 The deluxe copies of Enumerations contain representations of different forms of memory associated with the development of computing – trigonometry formulas, punched cards, slide rule, magnetic core memory. The slide rule sample is a design based on 20th century models using logarithmic tables designed by John J.G. Savard. " A slide rule can be considered a form of external memory, an early computer. The scales on a slide rule are logarithmic, in that the spacing between divisions (the lines on the scale) become closer together as the value increases, permitting multiplication and division." The last example in Enumerations (deluxe) is a booklet providing a primer on base 10, binary, hexadecimal, and Roman numeral counting systems. "Web programmers represent color in the html language by using six digit code representation. These six digits are hexadecimal numbers, which, when encoded in binary, correspond to specific color hues." Los Angeles: Stephanie Gibbs, 2017. Edition of 50. 5.5 x 5.5"; 108 pages. Endpapers from Paul Bercy, Simples Notions de Francais, New York, 1894. Printed onto Mohawk Superfine with an Indigo printer. 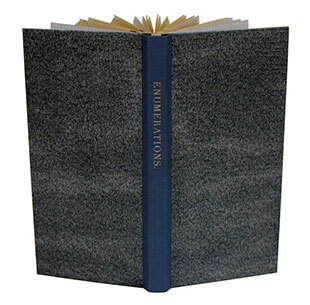 Bound in a three-part binding with stamped linen spine and gingham fabric over boards. Stephanie Gibbs: "In the summer of 2016, my sister sent me a text message. 'Would you like our grandmother’s recipes?' 'Of course!' I replied. 'OK, but you should know that the recipe for bread sticks begins "1 package hot dog buns." I was both fascinated and terrified. "My grandmother was born into a Greek family in 1921, and, as with many Greek families, mealtimes took place at the family diner. Family meals were an occasion more social than culinary; my memories of childhood Thanksgivings were of burnt pie and soggy vegetables. Yet, when the recipes arrived, unsorted, in a manilla envelope, I was charmed. These recipes were shared at bridge groups, in libraries, while volunteering, written onto whatever piece of paper was available. The tidy handwriting unifies the eclectic mix of papers, letterhead, receipts, and to-do lists. These 86 recipe cards were collected, compiled, edited, and expanded upon throughout the life of Helen Marchese, primarily from the late 1940s through the 1980s. "As domestic cooking becomes more and more professional, and personal recipe collections are held online rather than in boxes or in notebooks, it is reassuring to look back through the physical remnants of cookery and the exchange of favorite recipes, when the moment of sharing a recipe with a friend was perhaps more important than the finesse of preparation. These recipes tell both the story of an immigrant family learning to cook 'American style,' and the shared social tradition of food." Los Angeles: Stephanie Gibbs, 2017. Edition of 20. 4 x 2.75"; 40 pages. Printed on Asuka paper on an Indigo printer. Bound in quarter cloth. Sources: Botanical engravings from A Curious Herbal, Elizabeth Blackwell, 1739, from the New York Public Library Digital Collections. Herbal remedies from historic sources contemporary to the engravings. Monoprints on pages from the Encyclopedia Britannica, volume C, 1969. Stephanie Gibbs: "How is information disseminated and stored? Who has access to knowledge? Where does oral tradition and myth become standard practice? The role of women, as witches, midwives, healers, and heretics, was especially important and contentious where the kitchen garden met the apothecary and physician’s office, yet women have always challenged the erratic assumptions of a male medical field (e.g., the wandering womb) with treatments that provided relief and assistance. Yet modern medicine is still based in the herbal remedies of the deep past: aspirin is based on an extract derived from the leaves of the willow tree, and the strongest of modern painkillers are still based on the herbal properties of the poppy. "Elizabeth Blackwell, working in the early 18th century, documented many of the plants used for medical purposes. The variety of approaches to herbs as treatments as published in contemporary literature is provided here alongside reproductions of her engravings. "The engravings and descriptions are alternated with the greatest assemblage of uncontested fact, the Encylopedia Brittanica, an edition that both contains the collected wisdom of the ages, and yet still cannot escape the inherent and implicit prejudices of the times. As such, it is both a master document of information, and a constantly evolving resource that tells as much about a historic perspective as it does about dry historical facts. Here, the pages have been altered using monoprinting with inks and dyes, to bring aging and depth as a patina over the text." Los Angeles: Stephanie Gibbs, 2016. Deluxe Edition of 15; Standard Edition of 50. Standard version: Two volumes in paper slipcase. Volume 1: 4.25 x 5.5"; 56 pages. Volume 2: 4.25 x 5.5"; 16 pages including free end sheets; double-page Ouija board and Ouija pointer included. Sources: Eye engraving, Dioptrique oculaire, Chérubin d’Orléans, 1671; The Spirit Photographs of William Hope, National Media Museum; The Ouija, Kennard Novelty Co., Museum of Talking Boards. Printed onto Asuka papers using an Indigo printer. 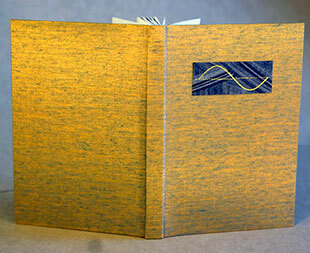 Bound in laminated Asuka paper over marbled paper with Joss paper endsheets. 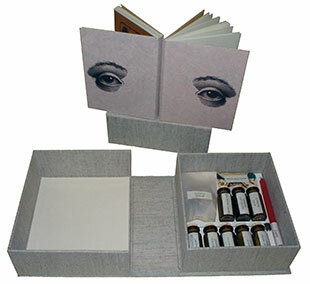 Deluxe version: 5.75 x 6.5 x 2.5" cloth-covered custom clamshell box. 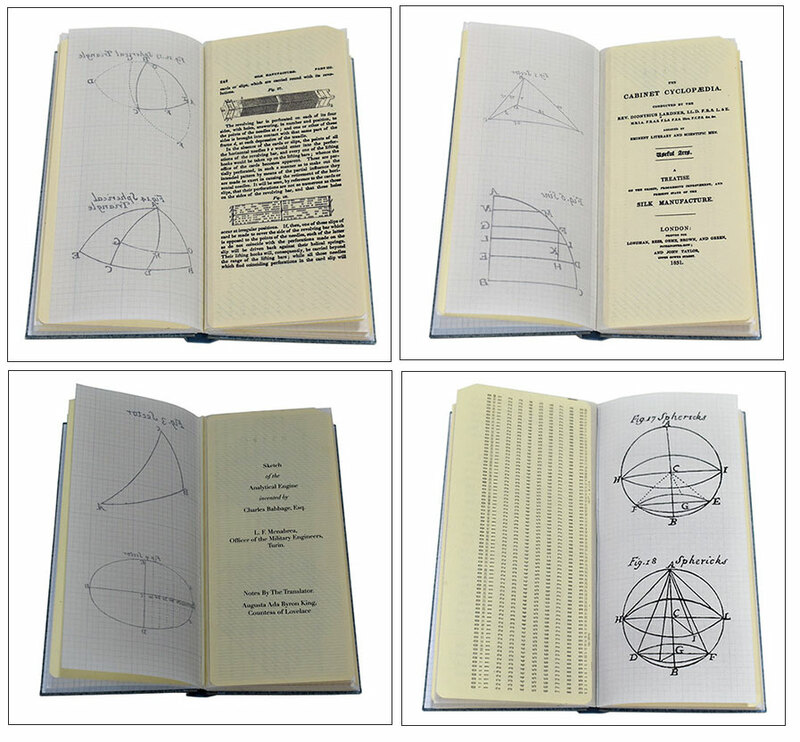 Includes standard version of two volumes in paper slipcase. Kit items: bell, candle, 8 2" bottles with stopper, and printed label. Stephanie Gibbs: "A fully assembled kit for contacting those who have passed beyond the veil. The user selects a spirit from the photograph album; chooses the emotional distillation that will pull that spirit into this realm; and uses the bell, book, and candle in the summoning. The enclosed Ouiji board then allows conversations between the realms. Animal magnetism: Felis catus vibrissae; Anticipation (concentrate): coastal sand; Disbelief (suspension): rosehips from Rosa multiflora Thunb. ; Hope (kindling of): phosphorus sesquisulfide and potassium chlorate on a balsa wood base; Memories (suppressed): Buddhist incense; Misdirection: antique key; Promises: seeds from Symphyotrichum lanceolatum; Rage (bottled): seeds from Asclepias syriaca L.; Resentment (shards): shattered family china." Los Angeles: Stephanie Gibbs, 2016. Edition of 22. 3.25 x 5.25"; 3 pages. Indigo pigment pastepapers. Sources: Photographs of the Catskill water supply system in process of construction, 1918, with A topographical map of Hudsons [sic] River, Claude Sauthier, 1898, both from The New York Public Library Digital Collections. Printed onto Asuka paper with an Indigo printer. 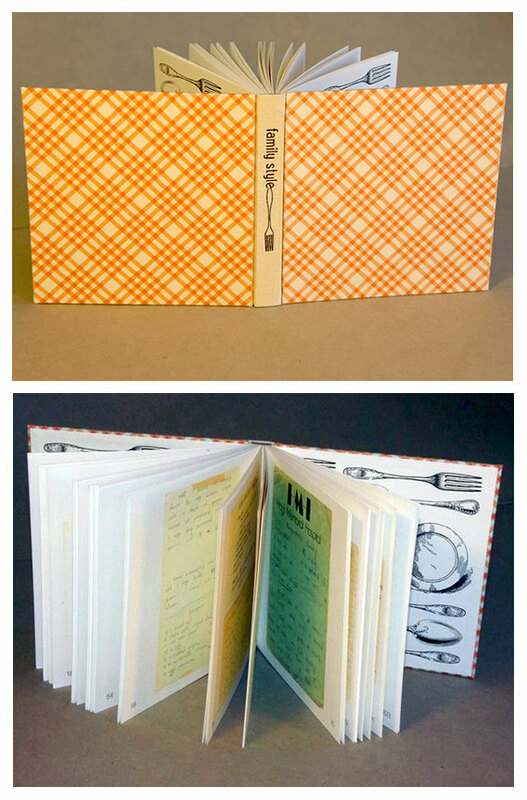 Full cloth binding, stamped paper label. Stephanie Gibbs: "Water is a resource that is simultaneously universally available and universally constrained: even in the midst of historic droughts, we expect it to appear, cool and clear, at the turn of a tap. We are advised not to drink out of the clearest mountain springs, for fear of bacterial contamination; to keep stores of it available for emergencies such as earthquakes or the zombie apocalypse; and yet, we wash our cars and shower and sometime have green, lush lawns are gardens. The scarcity of water is especially prevalent in the west, as rain conditions continue to fluctuate significantly from year to year as a result of climate change. This book combines archival photographs of the system that brought water to New York City, with pastepapers reminiscent of tunnels, rivers, and waterways."